During the Boer War (1899-1902) the first instance of dental surgeons operating during armed military conflict took place. While the Canadian Army Medical Corps existed, no separate branch of dental treatment existed. The large number of soldiers requiring dental operations at this time established the need for dental services to have a branch within the armed forces. At a Canadian Dental Association (CDA) meeting in 1902 a paper entitled “Dentists in the Army” was presented. This paper was the catalyst for the creation of a regular army dental staff. 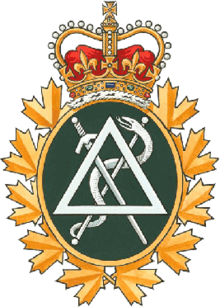 The CDA pushed the government of Canada to create a distinct branch for Regular Army Dental staff and in 1904 an establishment of 18 Dental Surgeons in the Canadian Army was authorized. In 1915 the first Canadian Military Dental Clinic was established in a stable at the Exhibition Grounds in Toronto. This was the first Military Dental Clinic in the British Empire. Operations overseas began in July 1915 with 30 Dental Officers and 74 other ranks. Within 3 years over 2.2 million dental treatments were performed including approximately 50,000 treatments for “trench mouth”. By the end of the First World War the Royal Canadian Dental Corps grew to 223 officers and 459 other ranks serving in field and stationary hospitals, and field ambulances. During World War II the use of dental records for forensic purposes came into prominence. This helped greatly in the identification of war casualties who lacked other forms of identification. Another new development during WWII was the formation of the Canadian Women’s Army Corps where the first female dental assistants were enrolled. This allowed male dental assistants to participate in overseas service. The participation of the RCDC in the Korean War was of enormous importance to the growth of the corps. During this war the strength of the Canadian Forces more than doubled and a similar increase in the size of the corps occurred. This permitted an improved rank structure and better career prospects for dental personnel. In addition, the standard of service provided in Korea under difficult conditions enhanced the reputation of the corps with future senior army officers and, as a result, facilitated acquiring desired improvements in dental care delivery. While this article focusses mainly on the Wars occurring between 1899-1953, the Royal Canadian Dental Corps has done so much to improve the dental health and care of our troops and civilians in war-torn countries. Read more about this amazing establishment on the Canadian Dental Association Website.